We all need a helping hand sometimes. I think we have all found our self before now with a disaster that needs a bit of money for a few days. Be it that the exhaust drops of your car,one of the children takes the toes out of their school shoes, or you need to pay for a removal van just before payday. My downfall was always the car tax until they introduced the monthly direct debit option, which I now use. I am lucky I always try and borrow money from one of the girls. Sadly now three of us all work for the same employer we are all skint at the same time of the month. I appreciate that not everybody can save money on a monthly basis for just such an emergency. I have a small amount of money taken of my wages every month by my employer that goes into a credit union. It means it is not shouting temptingly at me in my bank account but is available easily on the same day just by doing an online application. It has been borrowed more than once not only by myself but by family as well. It is also just as easy with an online payment to pay it straight back from the bank account when the next wage comes in. Now I appreciate not everybody has family they can borrow from or a credit union they can join and may well need to use a different option. This is where companies like Vivus come in. Vivus are a loan company that offer one payment loans to savvy borrowers who borrow only what they need thus placing control in the hand of the borrower. The borrower works out what they need and what they can afford to pay back come payday. No jargon or beating around the bush. To apply you must be over 18, a UK resident, with a regular income, a bank account that has a debit card and a mobile phone and an email address. You need to supply them with income and outgoing details, as well as details of your bank account. Vivus wants to remove the negative stigma from short-term loans. To disassociate from the negative press and connotations around this type of loan. Vivus are a ‘clean slate’ company who is making a ‘virtue out of doing this properly’. Vivus DON’T want customers to get into debt, but only to help them out of a short term difficulty. So what happens if for some reason you cannot pay it back on your agreed payday? Now while I personally do not advocate getting into debt I feel if you were to speak to your bank about a temporary overdraft or use one of the door step money lenders then you would be paying back more than you borrowed as well. So this may be an option to consider if you find yourself in a temporary sticky predicament. What #IWouldMiss if living rural or remote? I have a dream in my head, a dream that would only ever be fulfilled with a six number win on the lottery. I would love to go and live on part of an estate on one of the Scottish Isles. I can see my three bed bungalow, with a built in gym and indoor swimming pool, on a nice piece of wooded estate where Lilly could run to her hearts content, where we could walk for miles in suitable clothing. I would have a helipad with a helicopter and pilot to bring in my shopping. A small boat at the dock to take out and admire the wildlife. No near neighbours, no need for the commute to work, no worries about the remoteness as we would have a cellar full of tins and packets and a massive generator and some bottled gas for when we have any power cuts. Oh if only. But I am not the only one who dreams this dream. 25% of people are confident of their ability to self-sustain, ranking a local shop as a low priority when living in isolation. I do not feel I could self sustain, I personally could not kill and gut a living creature. and I know that growing food so far North would be nearly impossible. I suppose rural or remote is relative to where you live now. For some the small village I live in may seem rural or remote. We have a population of 2300, have no mains gas and have only had fibre optic available for less than a year. My Fibre optic runs at an average of 48mbps, which considering earlier in the year I was on old fashioned broadband and in an evening we could run at 1/4 mbps then we have seen a huge improvement withing the last three years. 80% of respondents think that living in a remote area would suit them. One of the things I missed when I moved here I have to say was my mains gas, quick convenient efficient cost effective central heating. But having been here for over three years now then I have got use to not having it. My fuel bills are sky high, I know some of the villagers have alternatives like oil and bottled gas but that means changing over the whole heating system. 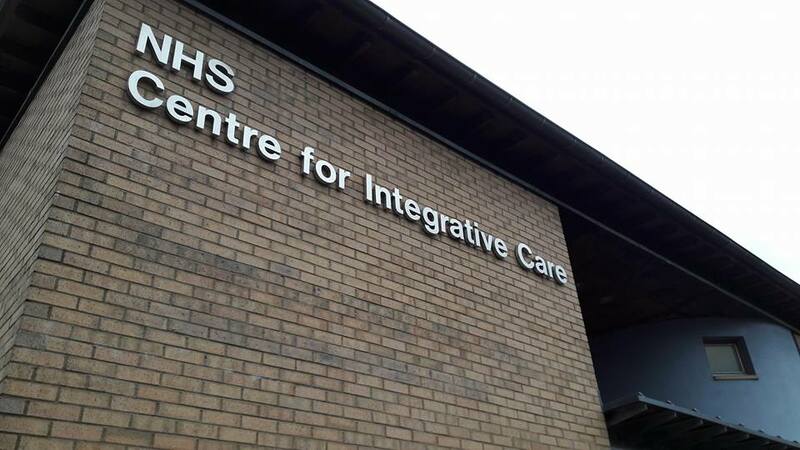 I take no personal pleasure in going into the big cities, I visit Glasgow for hospital appointments, and do not pleasure in a day of shopping there as many do. Glasgow in comparison to London is a lot less densely populated, so you have no chance of getting me there. When we were on holiday earlier in the year in a small village called Ellenabeich, which has a population of 59, we realised maybe we were not so remote. A village reached mostly by single track road. The children go to school in Oban on a Monday and board there until they come home on a Friday. The supermarket delivers to the ferry port, and for those that live on the smaller island of Easdale the ferry man brings your shopping over for you and people then use wheel barrows to transport it to the house. There are no cars on . They have no mains gas or a mobile phone signal. To get a signal you wandered to the top of the hill. We did get a signal and send messages when we were out and about but used the payphone for any calls we needed to make. The shop did offer to allow us to use the phone but I thought I would save that for an emergency. The pub would give you their wifi code if you made a donation to the RNLI. 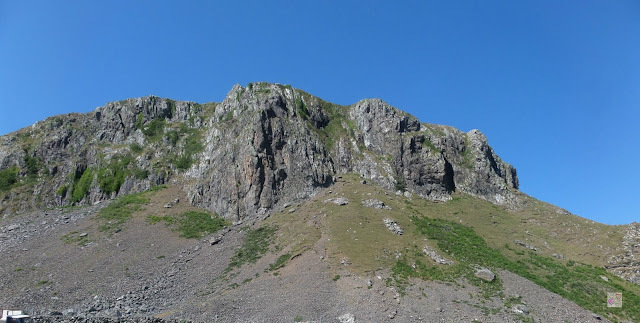 climb to the top for a phone signal. Almost half of respondents would miss their smartphone within a week! I have to say it is a beautiful place to visit, but would I want to live there? Yes if I did not have to leave the island every day for work. Most of the cars parked at the ferry port, I laughingly call it that, it is a wooden hut with a call button that connects to the wooden hut on the other side, are bashed and dented from the traumas of the single track road due to oncoming vehicles on one side and rocks and slate walls on the other. We did it in the day light of the Summer, not sure I would fancy it in the dark winter months. I have to agree not having running water is a nuisance. When we lived on the farm a number of years ago we often use to get a loss of supply just because of where we were. Not the first time I have hooked the hosepipe up to a none sterile supply in the barn to fill the bath to use to flush the toilet. It is the one service I would most hate to be without. No way for a wash, to cook, to put on your washing machine, or dishwasher, Yes you can drink bottled water but it is difficult to use an electric shower with it. 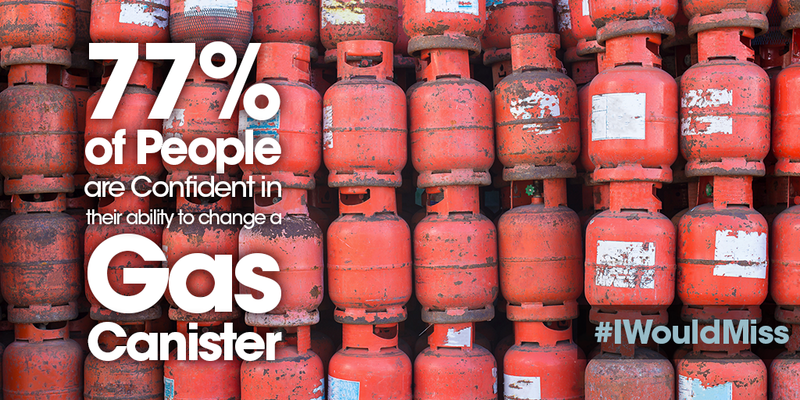 Coal, logs and generators as well as bottle gas would substitute for mains gas and electricity. 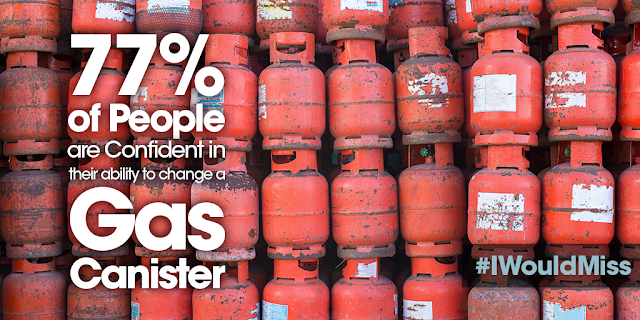 An impressive 77% of people are confident of their abilities to change a gas canister. How would you feel, could you give up the rat race, move from your cushy cosy city dwelling life to something rural, remote and off grid? Took Lilly for a run round the fishery the other afternoon. Our weather all week has been freezing, temperatures below freezing even during the day. But has been wind free and dry so not complaining. The ducks and swans may not be quite so happy about it with the ponds having frozen over. Here they all are walking across the ice. 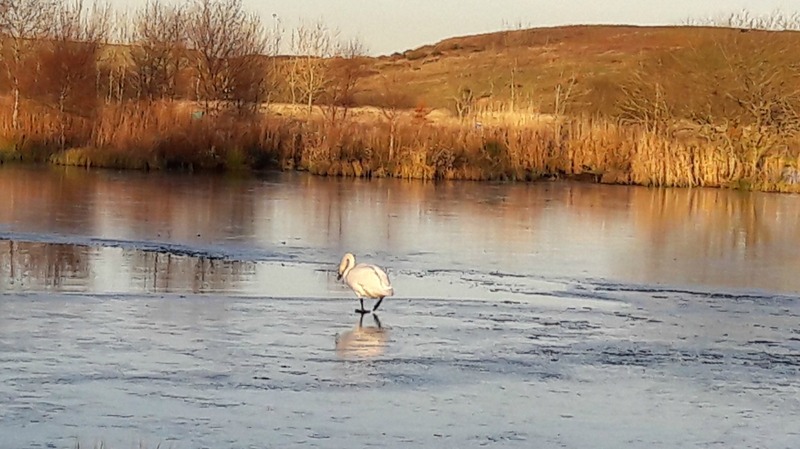 Here is one of the swans heading to the only unfrozen bit of the water. Been a COLD week here this week with temperatures not rising above freezing even during the day. But we have had dry bright sunny days, no heat in the sun I have to say, with little or no wind so has made for some nice walks. 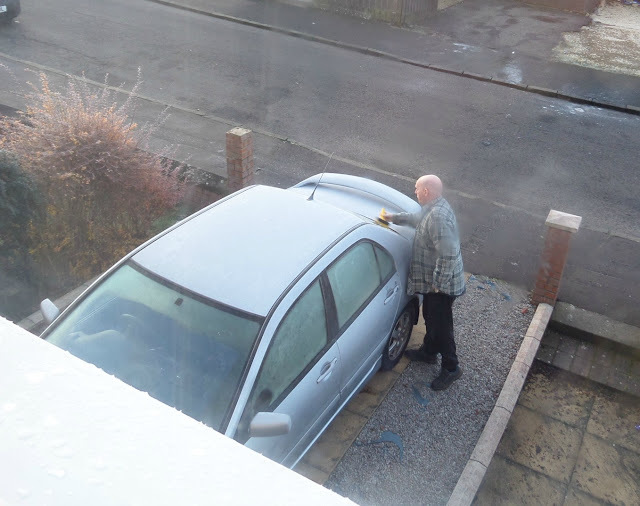 The girls at work laugh at me cos hubby spoils me by getting out of his bed and defrosting and scrapping my car for me to go to work in. I think it is just so he gets peace quicker.But no matter the reason I appreciate it. Two more birthdays, that is four within five days. Today the twins turned three. I made their cakes and took them down, but they were not getting candles on or allowed to eat them until after they had had their tea. 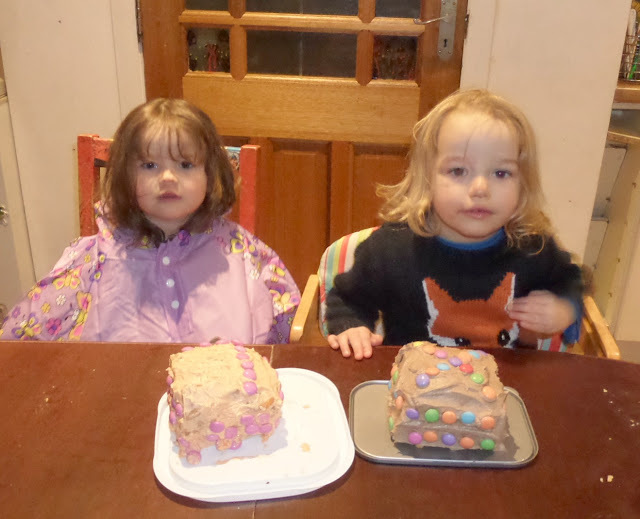 For the last two years I have got away with one cake between the two of them, this year I made them a smaller one each. 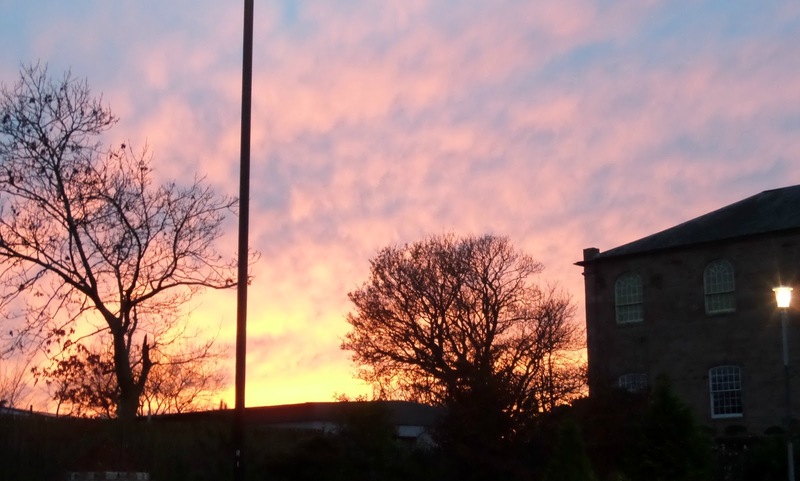 Have had some beautiful sunsets here this week. A lot of freezing cold weather to go with it right enough. Loved the marshmallow clouds. 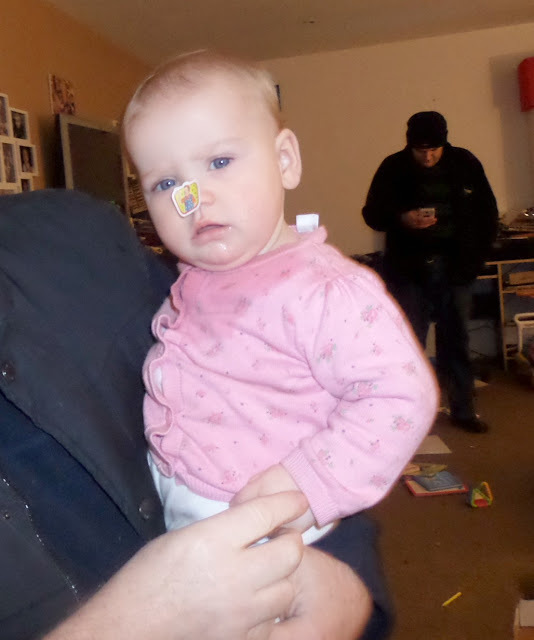 A picture of Spud with a sticker on her nose, Granddad stuck the sticker on her. Had to go and pick my glasses up from the opticians so we went for a walk along the beach. Did not get far as there were too many other dogs on the beach but Lilly had fun in her wee patch. There was snow on top of Arran but a strange yellowish mist rising off the sea that covered a lot of the isle. 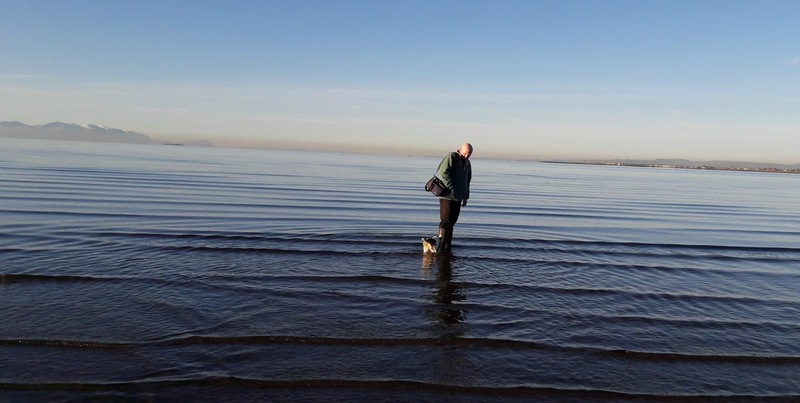 Hubby wandered into the water to see how deep it was, not overly for a long way out, but silly Lilly followed him, she did not stay in the freezing water for too long. Bought some reduced pears and plums after picking up my glasses. 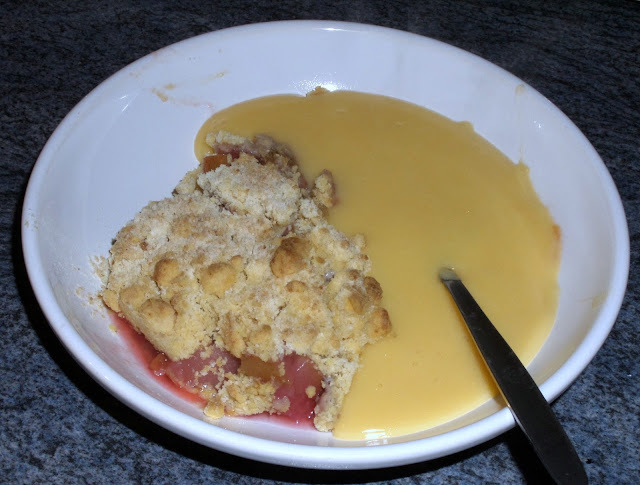 So made a pear and plum crumble and served it with coconut almond milk custard. Very nice it was too. 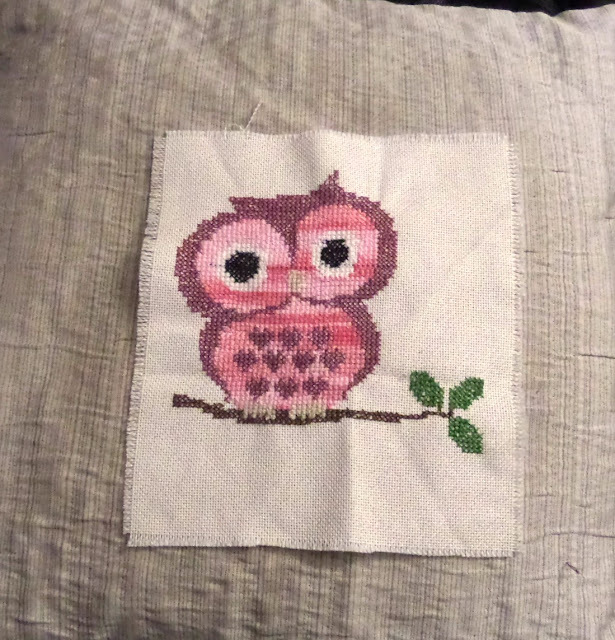 The cross stitching is coming along nicely, one more to do for Dinky, it is started, so am on course for having them finished for the first week in December, Just have to edge them and stitch them onto the blankets. Hopefully they will appreciate the work in years to come as Fifi does. I have private rented now for over twenty years.I have seen the good and the bad in this. I first got into it when I had looked for a swap away from the chemical plant we lived next too in Grangemouth that what having a detrimental effect on the health of my children. I had a nice three bedroom up and downstairs house with a front and back garden on a quiet road with a play park out the back and close to the shops. But nobody wanted to swap, not even people that came to look from tower black flats in Glasgow as my house sounded like heaven in comparison. But they took one look at the area and changed their mind. So I uprooted us from the east coast of Scotland across to the west coast to a nice village in East Ayrshire. Had a lovely flat and an amazing landlord.They became good friends and we still bump into them occasionally when out and about. I remember the really really cold winter when all my outgoing water pipes from my bathroom froze and we could not use the shower or flush the toilet. The landlord came out and brought a hot air gun and sat for over two hours heating the metal pipe enough to thaw off the frozen pipe and get my water flowing again. They were what a landlord should be - there anytime you had an issue with the property but left you to do what you wanted in your home as long as it was not detrimental to the property. Sadly not all our experiences have been so good. We quit one house when we had water pouring through the lights in the kitchen ceiling and the landlords answer was to disconnect the electric to it and provide us with two lamps to use in the kitchen rather than sort the flat roof above it. Some landlords just appear to want the rent but not the responsibility. From there we moved onto another property we really really liked. A three bed two bathroom flat with a secure entry and a lovely neighbour down the stairs. The neighbour was into gardening and encouraged us to grow vegetables, we learnt a lot from him. But just before Christmas one year we asked the landlord would we changed the living room carpet, at this point he told us he had sold the house and we needed to be out by the first week in February. So private renting leaves you with no secure tenancy. From the house sold under us we moved to a property through a letting agent. There are many agencies out there - some good some not so good and some just absolutely awful. HomeLet have made up a useful infographic to give you some fuel for thought. We thought this would offer us more protection and security as most agencies let long term. There are dozens of agencies out there, some good some not so good. It was difficult at the time right enough to find one as at the time a lot of agencies wanted fees to put you on their books, Many of them wanted to charge you for a credit check to make sure you were a good bet. Some wanted us to pay for reference checks, some even wanted separate ones for both my husband and I. Then there were even some that wanted three/four/five months rent up front. Some wanted us to pay a holding fee for a property, and would take the same fee of more than one interested party. This has been illegal in Scotland for a number of years but it did not stop it happening. Whilst we were not prepared to pay it many others were. It is soon to be become illegal in England and Wales as well. Our contract did have the scenario of the landlord being allowed the property back to live in themselves if they wanted it, this is not unusual and we found this is commonly added to any agency agreement. Sadly we found an agency that employed a handy man who did any jobs needing done, a great idea we thought, a direct line to him 24/7. Sadly we were informed by our neighbour that this handyman was "inspecting" the property when we were not in, so we fitted an alarm to prevent him from doing this. We then moved into the best property we ever lived in. A huge farmhouse with loads of room for our by now adult children and their other halves. It was rural but a great place for the grandchildren to run around, lots of space to walk a dog and no noisy neighbours to contend with. It was cold and draughty as it was hundreds of years old with huge big thick walls and inadequate heating but we loved it. Sadly it was one the landlord took back for family to live in. They built a dairy just out of the back door and wanted the house for a farm worker to move into. But having said that we got nearly three years notice to quit. Private renting does have some advantages, I know what my monthly rent is and have only had one landlord that put the rent up every year, the rest all stayed steady. The same cannot be said for a mortgage. If anything goes wrong I just make a phone call and the landlord will pick up the bill for any repairs. It is easy to up and move if you wish to, no selling, no buying, making it easier to relocate for a job. My advise to anyone looking to private rent is to use a reputable agency and know your rights. 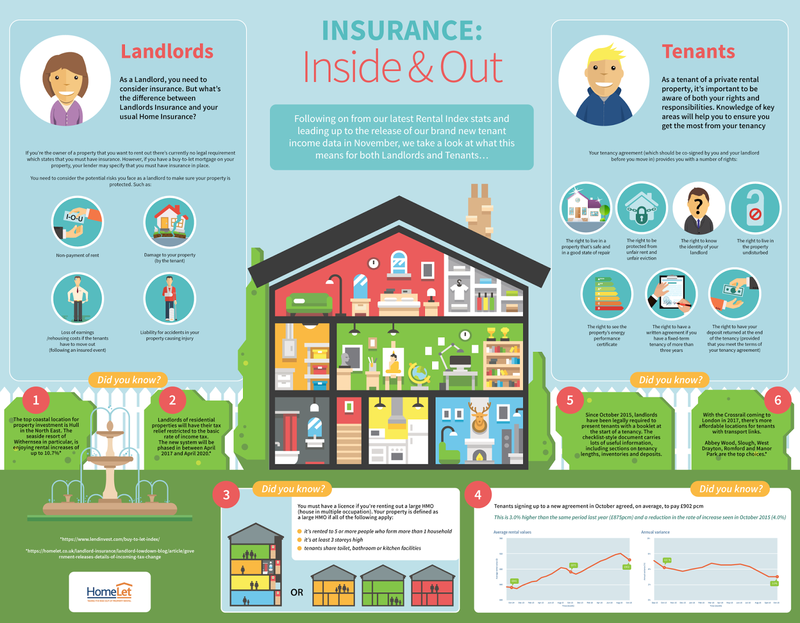 Have you ever private rented and have any hints and tips to share? 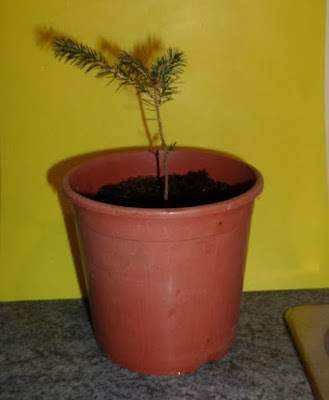 Many years ago our last dog dug up a tiny sapling that we brought home and planted in a pot, eventually we found a permanent piece of ground to plant it in, it is now approx eight feet tall. The other week we spotted a sapling when up the woods with Lilly, and so I decided Lilly had to have her own tree as well. Hopefully it will grow and thrive. I was taking some photographs for a review blog post ( post to follow) and was using the living room floor as no matter what I do in my long narrow kitchen with a three spot light there is always a shadow. Lilly decided to come across for a nose and decided without being asked to sit nice. 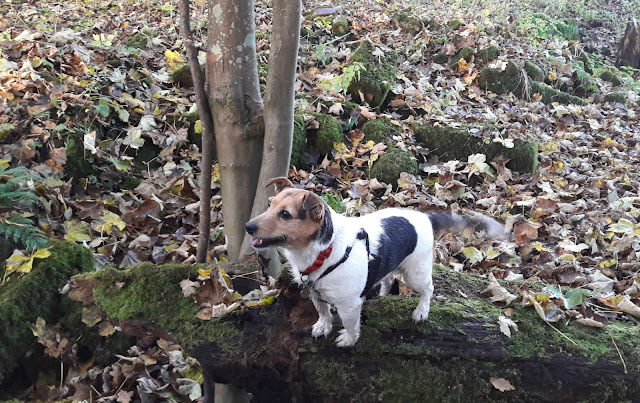 She never sits nice when I have her amongst piles of autumn coloured leaves or on a log. Bobs turn to be ill this week, so I went and watched the three wee ones while DD1 took him to the doctor. A course of steroids to try and save it getting too bad and lots of doses of his blue inhaler. 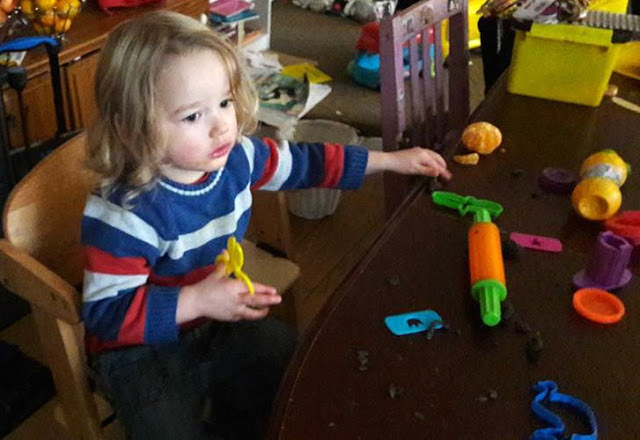 The twins were playing with playdoh. DD3's birthday today. 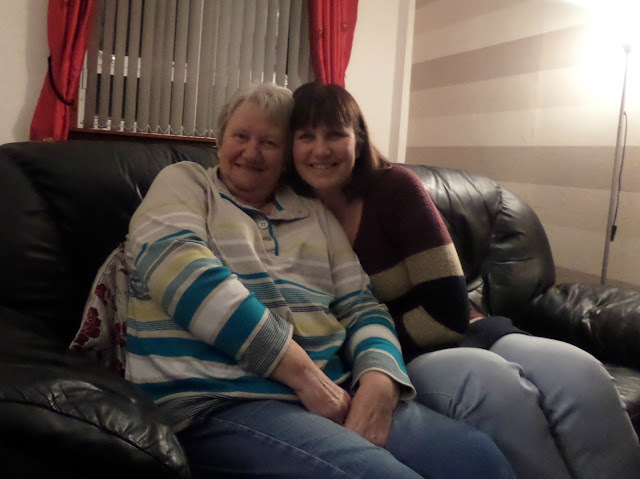 We met up with her at Sunshine on Leith at Centrestage in Kilmarnock. DD3 had bought the tickets for us as both hubby and I have birthdays this month as well. We then took her to McD's for something to eat.Easiest place to get to at gone ten on a cold horrible night. Thoroughly enjoyed the show and the cast seemed to enjoy themselves as well. Fifi and Bob wanted to come over and help make items with the hama beads. 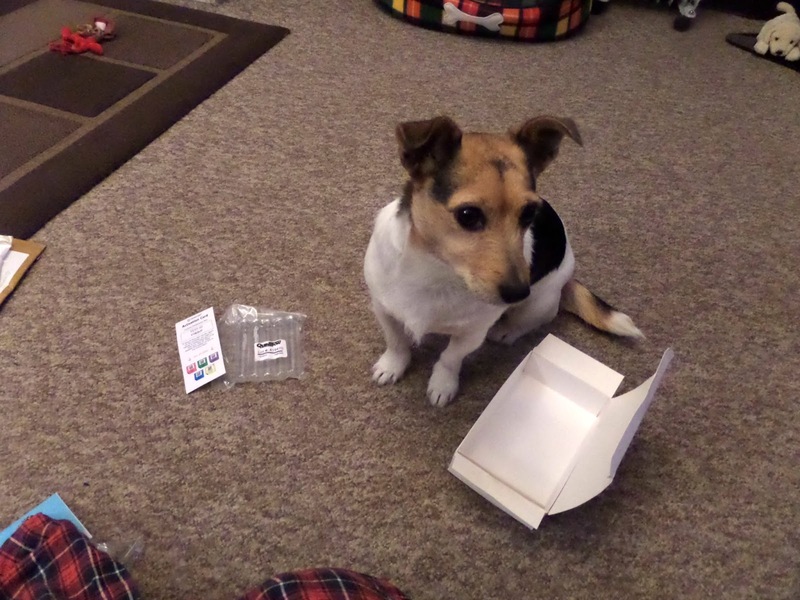 I printed off some easy Christmas baubles for Bob but he decided he wanted to try something far to difficult for him. He then tried to copy Fifi and that did not work for him either. So spent half the evening in tears because he could not do it but would not relent and try something easier. 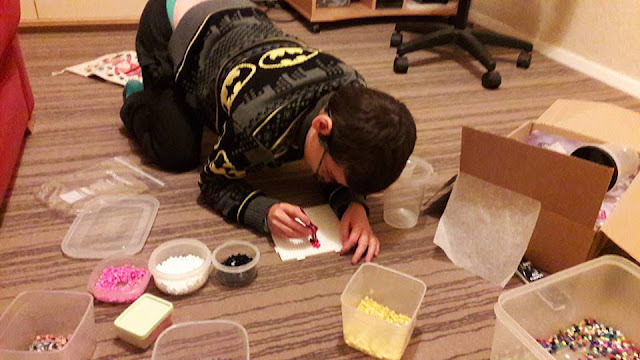 He then wrecked the second one that Fifi was working on to try and cause an argument, so we put the beads away. Second birthday of the week. Today Fifi turned fourteen. Life is getting easier as she just asked for a cake, no specifics other than that. Made her a rectangle with butter icing and surrounded by matchmakers. I have been toying over the idea of a sonic toothbrush for a while now. My electric one is not holding a charge. So when I was at the dentist last week I asked what they thought about them, They approved of them and coincidentally they had one for sale in the surgery. A quick google and as the price of the brush was the same locally as it was in the surgery, Did look on the Every Day is black Friday site as well,* but decided just to buy there and then. It is a Colgate Omron and at the time was retailing in most places for supposedly half price at £29.99. Have to say I am very impressed. 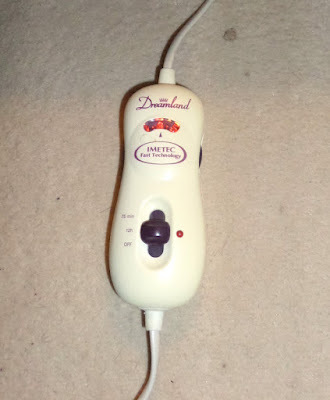 The buzzing takes a bit of getting use to, even after using an electric one, but the cleaning results are great and much gentler on my receding gums than my electric brush. I have to say I never seem to need treatment and only end up at the hygienist once every three or four visits, but my teeth do feel cleaner the next morning than they did. An easy drop in charger with a charging light so you know when it is fully charges and a warning light on the front for when it is getting low. Has a 30 second warning so you know when to move quadrants which is handy, and switches off at the end of the two minutes, I would prefer a ten second warning, but getting use to working in the four quadrants rather than wily nilly so may well be a good thing. 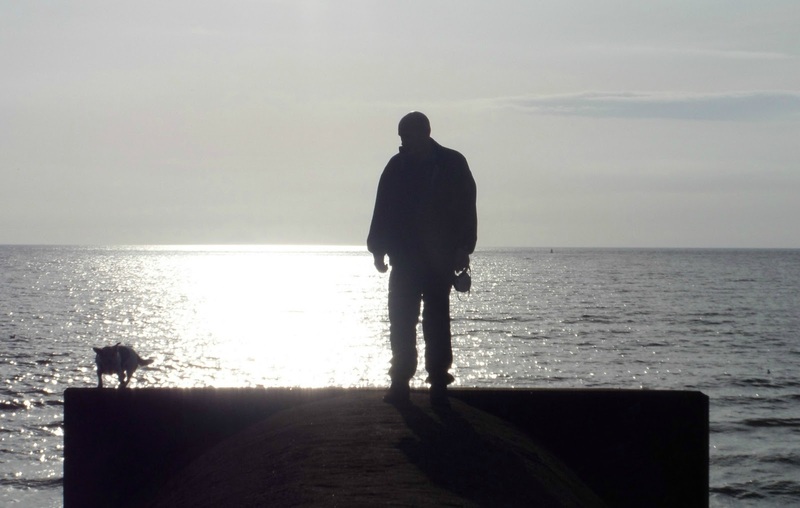 When I was bringing my own children up we lived in a designated area of deprivation. An area in the central belt of Scotland. We may not have had much but with a struggle and very careful management of money my children were always fed, I was very good at eeeking out cheap home made meals. They always had clothes on their back, very few of them ever new but clean none the less. They always had birthday and Christmas presents, again maybe second hand but young children do not notice, They all remember the home made birthday cakes that the friends that came from the other end of the town were jealous of because their parents bought theirs.My children would have loved a shop bought cake, a case of the grass is always greener. 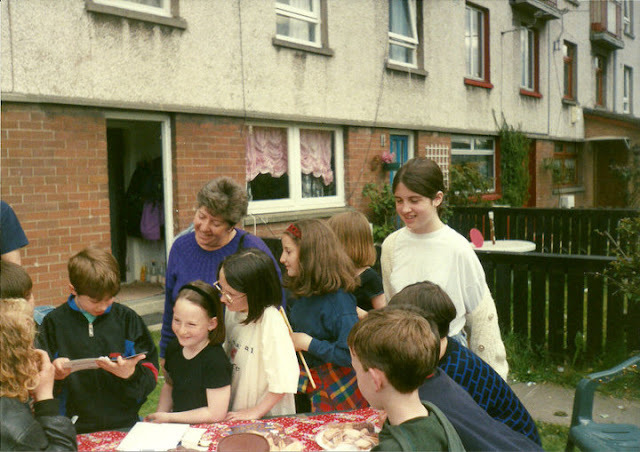 A combined birthday and leaving party when we moved away from the area. They attended school every day and during the holidays spent a lot of time in an out of school holiday project in which I was a volunteer. This gave them access to all sorts of opportunities they would not have had other wise. The spent their summers abseiling and gorge walking, windsurfing and canoeing, taking part in arts and crafts activities and putting on shows with dance routines and hand made costumes. A lot of this was made possible by grants and charity donations. So when Oxfam asked me to tale part in a Collaborative post to tell you about their appeal I could not help but think back to the life I gave my children. I have to say I did not feel my children were deprived. They had as much as other children in the area. If I compare their lives to the lives my children have worked hard for to obtain for my grandchildren then yes they probably were. But then it is normal to grow up wanting better for your own children, and as parents we all do the best we can with the hand life deals us. A third of Ethipoia's rural population are small scale farmers living hand to mouth with subsistence farming. Their crop is their only food source and if they have a bad harvest then they do not have enough food to eat. It becomes a vicious circle. This is where charities like Oxfam can step in. Let me tell you Kitabe's story. Kitabi had to drop out of education at a young age as she lived and worked with her family in Bulbula, Ethiopia.The family were poor and their food was scarce, so children had to work to sustain themselves. She was forced into an arranged marriage. But she wanted better for her children. With the help of Oxfam Kitabe has built a better life for herself and her family. 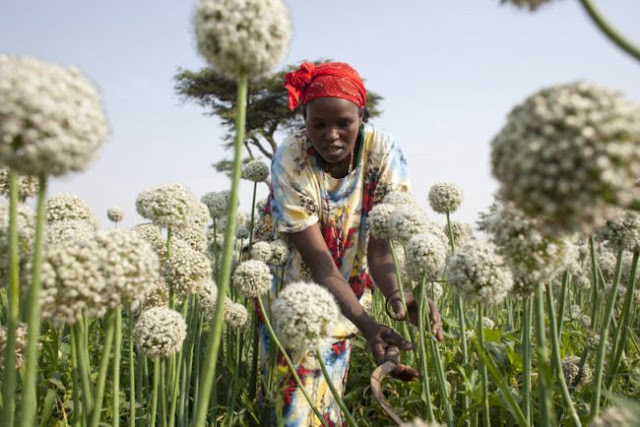 Kitabe made the brave decision to borrow 10,000 Birr from Oxfam - the equivalent of £324.This allowed her to buy seeds to grow crops. Luckily the gamble paid off and she paid back the loan when her first harvest came in. Since then she has bought more land, bought a cow and an ox has enough money to pay for labourers on her farm. She now spends time managing the seed production on her farm. The scheme has allowed her to manage her money more effectively, leading to a brighter and more secure future for herself and her family. Every donation you make makes a difference, big or small it all matters. Last year Oxfam helped 11.6 million people in 51 countries. With 4.3 million reached through healthy promotion activities. 270,000 people like Kitabi benefited with support to improve their crops, goods or services. 5.4 million people were provided with improved access to clean water. Donations are vital, and you can donate online to Oxfam. I often feel a charity donation makes a nice Christmas present for adults in your life. Why spend £X on your son, daughter, parents or grandparents buying them something they do not really need when you could donate on their behalf instead and make a real difference to the future of somebody who would appreciate the help? It is a lovely time of the year for a walk with so many beautiful colours of nature to see. 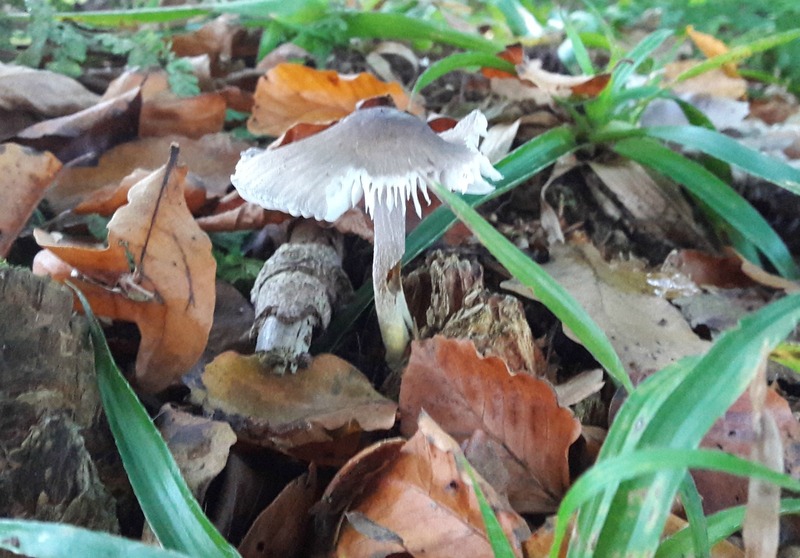 Cold frosty nights leading to bright sunny afternoons that make for a nice walk. Along the river at Failford is such a lovely place for a walk. 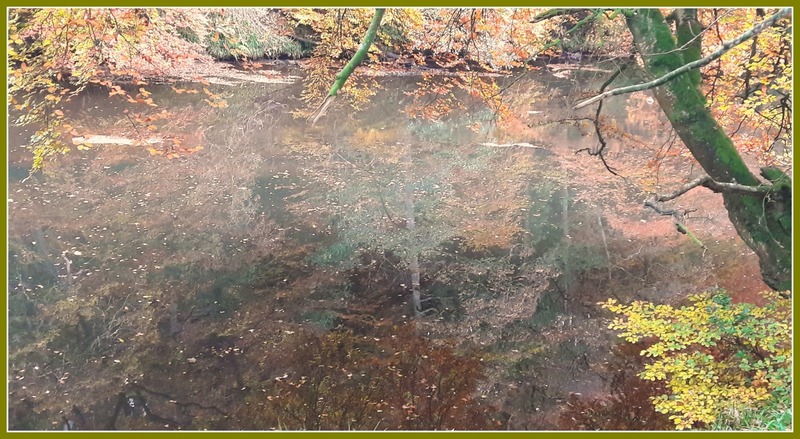 Hard to tell where trees end and reflections start. Been a bit of a medical related week this week between one thing and another. Also been a much colder week with our first snow of the winter. Hubby has been out to scrape the car and warm it up for me before I go to work, its the little things that make a marriage. 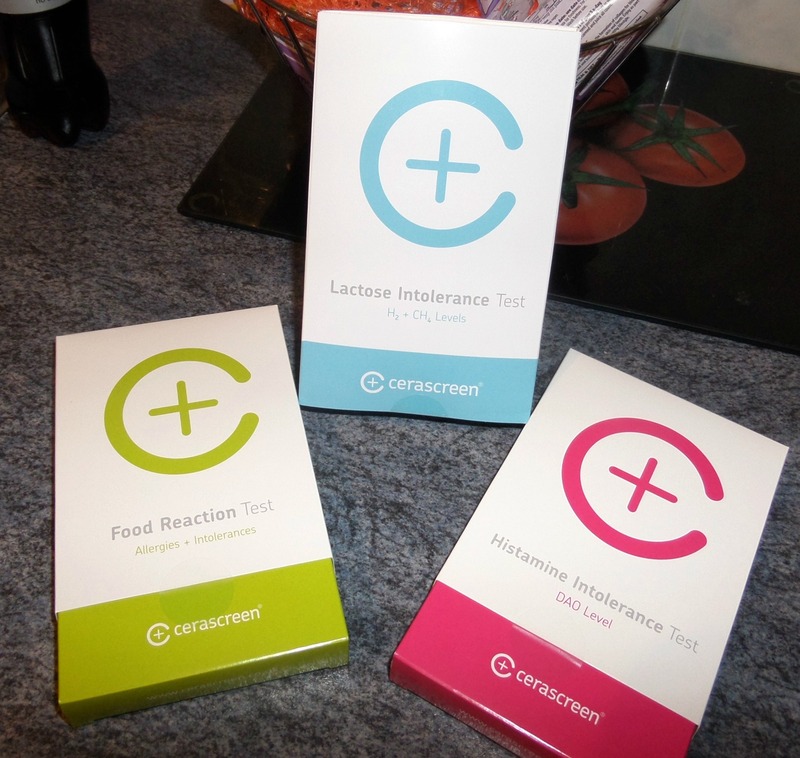 Was offered these through a blogging link, and as I have food allergies that I know of I thought they would be interested to do a review on. Did not look at the instructions in them until Wednesday but they need to be done and posted away on a Monday or Tuesday so they will need to wait until next week. Cold cold nights, and as we put clean sheets on the bed on a Monday we popped the electric blanket on as well. Nice to get into a warmer bed. Had my flu jab at work on Sunday, by today the injection site was very hot and sore so I went to GP to get it checked. She drew a red line round the edge and said if it spread beyond that come back, luckily it didn't. Bob phoned to ask if he could come and stay for the night. So we spent time some time doing hama beads and playing happy families. Bob helped me chop veg to put tea in the slow cooker before I went off to Glasgow for a homeopathy appointment. Had asked the GP a few weeks back to see if it may help to keep some of the allergies under control. She is going to work with me for at least a year and is starting by settling down my gut before she adds something else in when I go back in two months. The hospital is in the middle of Glasgow but during my appointment I was watching squirrels and a fox out of the patio doors. Was very tempted to whip out my phone and take a picture of the fox but thought I better not. NHS send you for the appointment but do not supply the medication so I need to get it ordered up. Had a dentist appointment this morning, a six month check up. All ok. Then went to the optician as I broke my glasses so handed them in for repair. Did a wander of the charity shops and bought myself a pair of black boots, brand new never worn. Also go a couple of things to upcycle for Christmas. First day I have had all week to go out for a walk with hubby and Lilly. Took her to Failford where she loves to run in the woods. 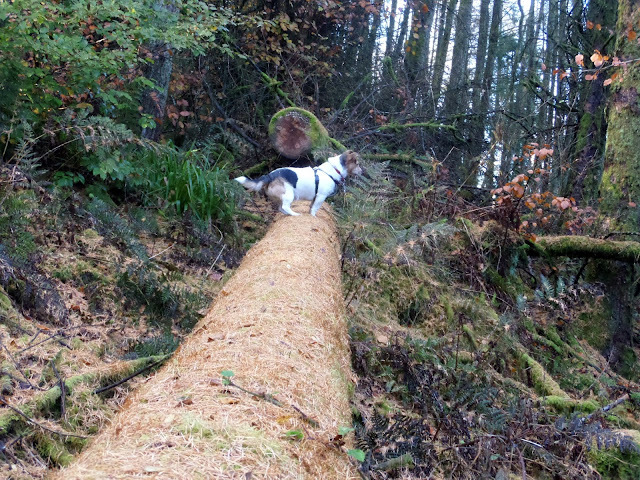 Did pass another couple with two dogs but Lilly calmed down very quickly. Lilly listening intently to something. Have been sorting out the boot of the car adding an emergency pack with hats,gloves, waterproofs, bottles of water and snacks in case of breakdown or stuck in the snow. 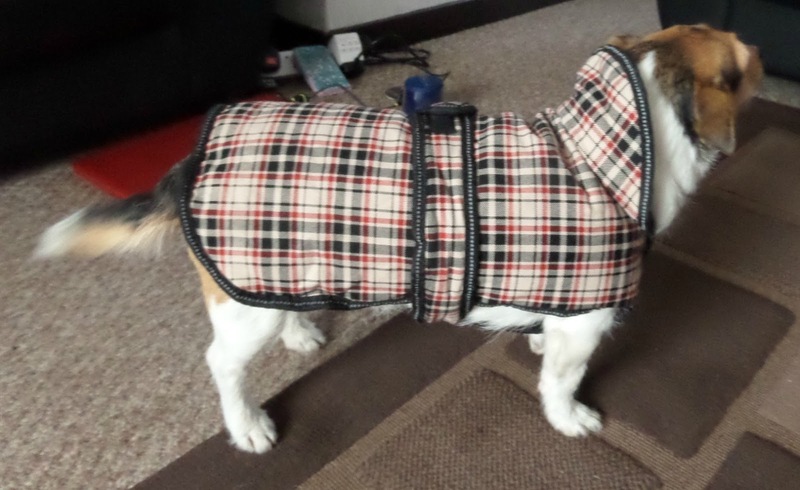 Also added a jacket for Lilly in case she has to get out the car with us. Will need to look for a reflective one for her at some point. 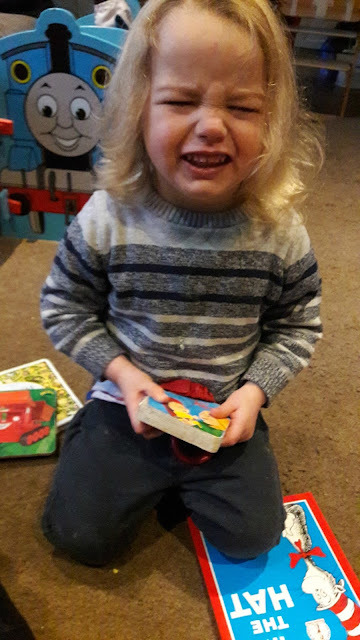 Did the after school activity run as Spud has a chest infection and needed to go to the doctor and DD1 has a frozen shoulder and could not drive. Lilly in her new coat. 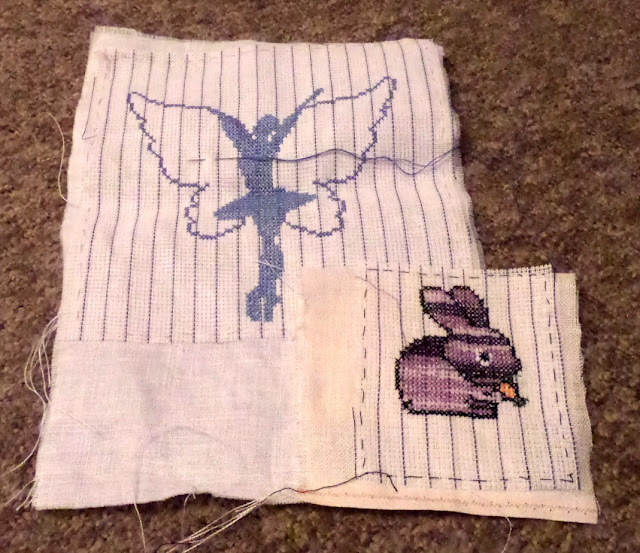 Plodding away with the cross stitching, still got two of Dinkies to finish and two more to make, Have got a six hour day coming up where I will just be sitting around so hoping to use that day to get the two nearly finished ones completed. I am hoping to have the sewing finished by the end of this month so I can get them assembled and the hama bead items done as well. Six weeks is all I have and time is running away with me. Here is a finished rabbit and a fairy. The fairy as you can see is an easy finish as wings are all one colour. Not decided yet whether to go for a straight lilac or a variegated blue. who says a rabbit cannot be shades of purple? 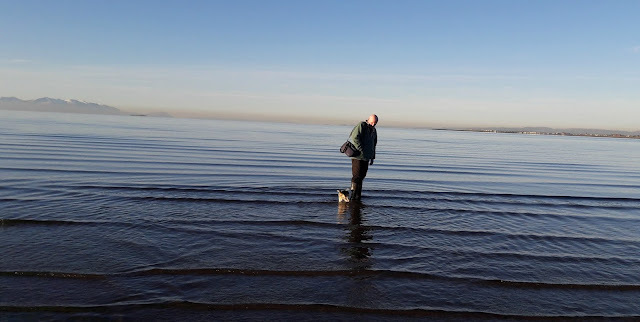 It was a lovely day last Sunday so we decided to take the dog down one of the quieter beaches in the area, grab some lunch and do some shopping. 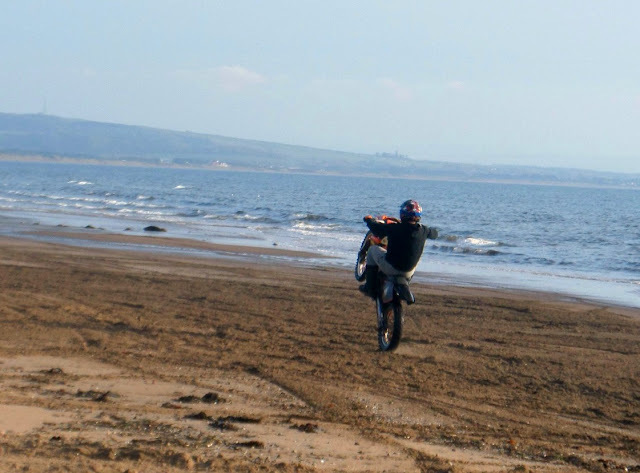 We did not realise that particular bit of beach on a Sunday seems to be a local meeting point for scrambler bikes. I have to say they were all very considerate and mostly used the beach past where we were walking. 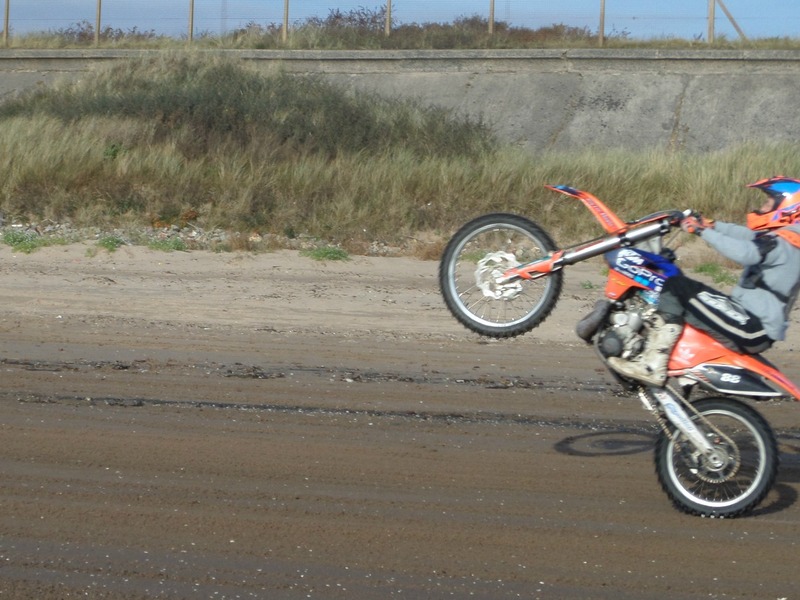 Was quite difficult to get anything decent because they were mostly riding well away from us, but managed to zoom in and get a few. Surprised how well the camera stopped this one considering it was zoomed right in. Using up holidays and had a weekend off work. Today was a beautiful day so we went for a drive down the coast and a run on the beach. Bob decided he was going out trick or treating rather than going to gymnastics, so we took the dog a walk before it got dark. DD1 wanted to go shopping and did not fancy taking all the children with her, so I said I would watch them while she went. Was not overly difficult as the twins have dancing on a Tuesday afternoon and daughter was back less than ten minutes after I picked them up. Bob helped with some Christmas stuff. 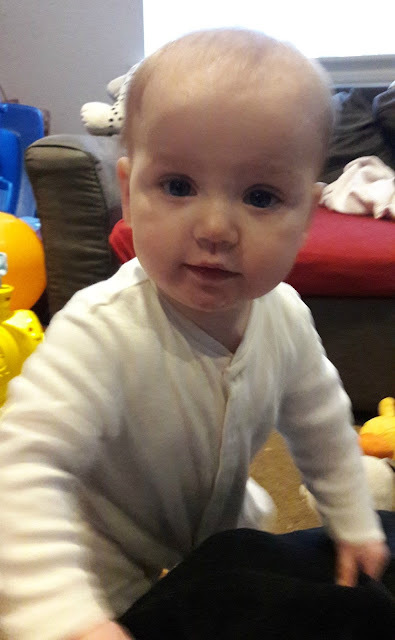 Spud can stand herself up now but cannot sit herself back down so will cry for you to sit her down, at which she crawls to a piece of furniture and stands back up again. Another nice day, another walk with the dog. No this week has been no more exciting than that!! An early morning phone call from DD1 to see if I would go and sit with Spud and Minky whilst she took Dinky to the doctor. Minky was not at all impressed that I was talking to Spud and picking her up and giving her cuddles. I asked Spud to smile, so this was Minky smiling instead. SIL was back up north for a few days, so her and Aunty M came for dinner. Had roasted some pumpkin for soup as part of last nights dinner. 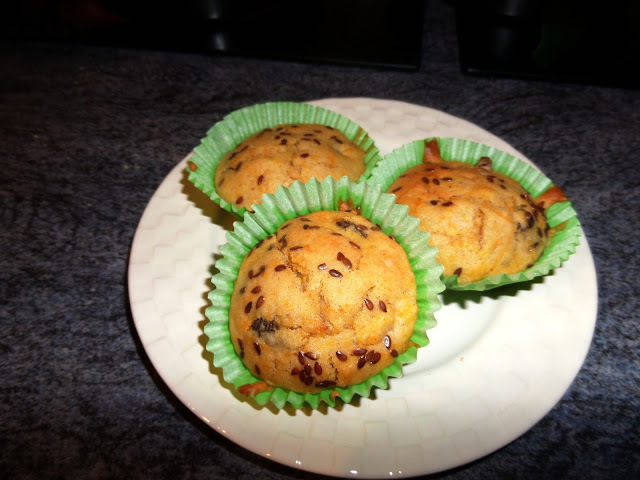 So decided to make some pumpkin and raisin muffins with linseed sprinkled on the top. Very nice they are as well, light, fluffy and fairly healthy as the pumpkin and raisins makes most of the sugar. Some hints for my birthday or Christmas. I am very difficult to buy for. Don't appreciate flowers, don't thank you for chocolates, never wear jewellery or perfume and because of allergy issues do not really enjoy a meal out either. 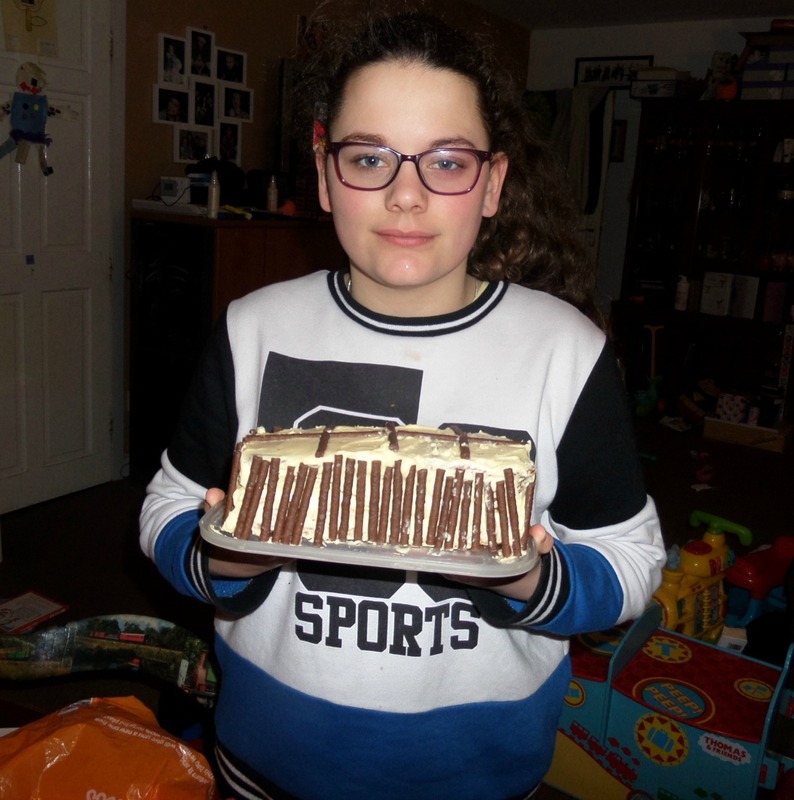 It does not help that my birthday is less than a month before Christmas and the sixth birthday in November so people are all caked out and fed up of birthdays time they get to mine. So apart from jelly tots or liquorice allsorts what do I pop on my wanted list? Well now the darker night and morning are back here I quite fancy starting myself off on the couch to 5k, they say anyone can do it. Well I am anyone so it has to be worth a try. 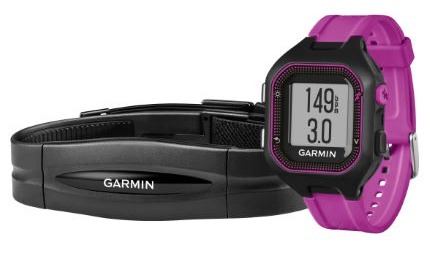 Look at this Garmin Forerunner GPS running watch, how great would this be for showing my improvement? It should show the improvement in not only my time but the benefits to my body. Maybe I could also incorporate some running when out with the dog. Now due to the fact I have to carry epipens every where with me I am never without a bag of some sort. 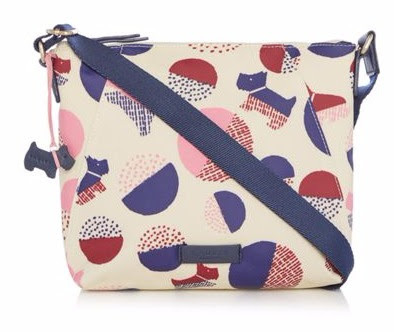 How cute is this cross over body Radley bag from House of Fraser. Notice the dog theme creeping in. Talking of walking the dog. 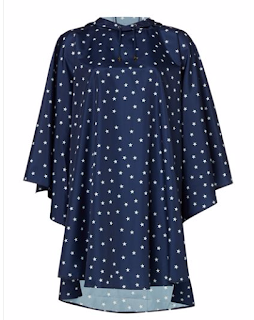 Half the time I end up taking a jacket, just in case it rains, but end up far to warm and tie it round my waist. This light weight waterproof poncho Pac a Mac from House of Fraser looks a nice compromise, light weight enough to wear on its own, or in the colder weather that is rapidly approaching would go on top of another jacket. Comes with its own draw string bag that would attach to the bum bag I carry. 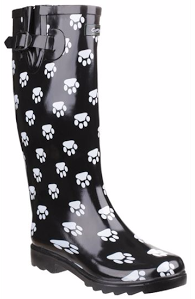 Pretty much anywhere we walk the dog round here that she can get off the lead and run is either fields or woods and therefore in the winter rather muddy to say the least, so a nice new pair of wellies would be a godsend.Love these ones that House of Fraser have at the moment. Sorry again you will notice a theme running through this post. Now we all know there is not a lot of warmth in a welly, great for the wet but not so warm on the feet in the snow and ice. 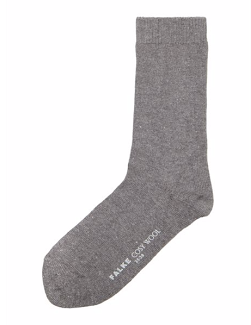 So these Falke cashmere and merino wool socks from House of Fraser would be a great addition to my comfort level when out. 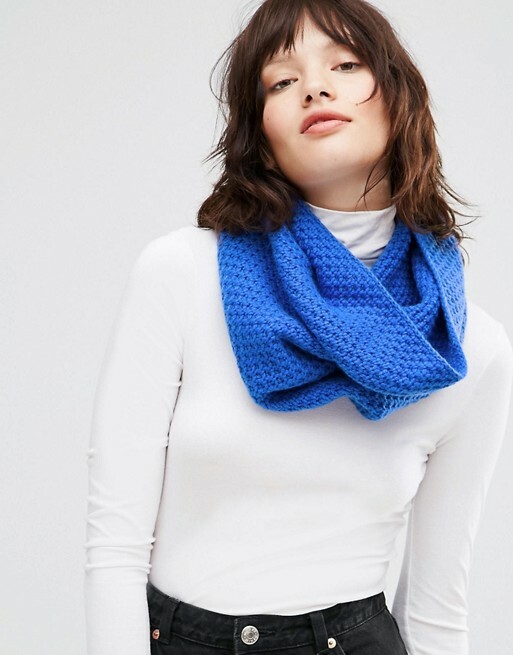 Lastly to top me off, literally, this cashmere snood from Asos. Keep both head and neck warm with no need to keep adjusting a scarf. I don't know about you but scarves annoy me as I can never get them sitting quite right.